A Georgia summer: it’s hot, humid, and the ultimate enemy of a beat face. Whether you chose to host your guests on the gorgeous courtyard of Flint Hill, or inside its grand ballroom, you will want to be prepared. With rising temperatures and your summer wedding right around the corner, you’ll need a makeup look that will withstand the humidity. Keep reading for tips and tricks for beating your face and the heat! The golden rules of summer wedding makeup are as follows: keep it light; keep it bronzed. Your skin is the single most important aspect of your makeup look, especially in the summer months. Start with a primer that suits your skin type to ensure a lasting finish. Switching a heavier foundation for a lighter coverage one, a tinted moisturizer, or even a BB cream can do wonders for your skin. These products are triple threats! Many contain SPF and moisturizing ingredients, protecting your skin and leaving a radiant glow. SPF is vital for a bride with an outdoor summer wedding. Applying this product with a synthetic brush will help your skin absorb the product fully, allowing the product to last all day. Remember, the cakier you apply your makeup, the most likely it is to end up a hot mess within a couple hours. Adding color to your face during the summer can be a lot of fun. Stick to warm colors such as bronzy browns, golds, oranges, and corals. These colors compliment a nice summer tan, and are the easiest way to achieve the best makeup for a summer wedding. Bright pinks with warm undertones can be added for a pop of color. A hint of coral or bronzed blush can add a healthy glow to your cheeks, without being too overpowering. The best way to ensure staying power is to switch to a cream blush. Many beauty brands offer a waterproof cream blush during the summer months. Makeup hack: use a warm-toned lipstick as a cream blush. It works swimmingly! 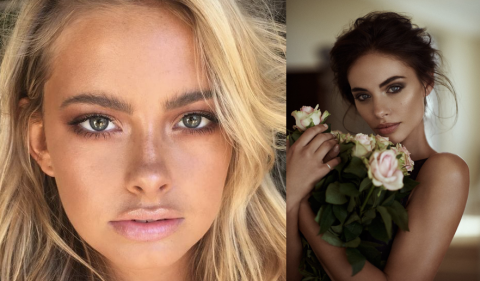 Many summer brides choose to go lighter on eye makeup in the summer, for fear of the notorious “racoon eyes.” This happens when either mascara or eyeliner melt and run down under your eyes; it’s not cute. To avoid this catastrophe, opt for waterproof mascara and eyeliner. Makeup hack #2: putting castor oil, or a nut-based oil such as macadamia oil, on your lashes can double as a growing agent for your lashes, while also making them appear darker and fuller. Curl your lashes after applying for a fuller, natural look. Now you can rub your eyes without fear! Finally, lips are the second most important part of your summer look. Jumping from a scorching exterior to an air-conditioned interior can leave your lips dry and flakey. Prime your lips with an SPF infused balm to protect and hydrate them. Stay away from highly-pigmented lipsticks, such as bright reds, purples, and blacks. Within minutes, these creme formulas can melt and end up on your chin. Instead, stick with colored lip glosses or a matte liquid lipstick. Matte lipsticks can easily be reapplied on the go, without transferring the product to your new hubbie’s lips when he says ‘I do.’ Finish off your entire look with a spritz of waterproof setting spray to seal in the products. Summer wedding makeup can be tricky, especially in the South. By using these tips and tricks, you can achieve an effortless wedding makeup look, while protecting and replenishing your skin from the sun.